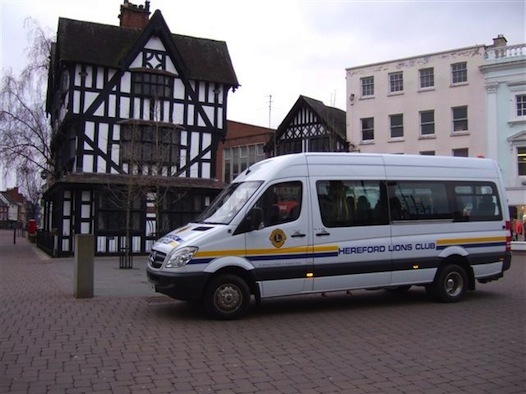 Hereford Lions Club bought their first mini-bus to launch a new community transport service in 1965 for £698. Now, the club is celebrating the 50th anniversary of the service with a top of the range Mercedes mini-bus which cost £48,000 when it was bought in 200 7 and now has 88,000 on the clock..
Over those 50 years the service has clocked up half a million miles and carried an estimated 50,000 passengers on a free ride. Whilst the service is free Lions ask for a donation towards the fuel and running costs which in recent years has soared. Club members are volunteer drivers. The service is used primarily by the elderly and the handicapped.